Getting down to the home stretch now, only three to go. For today’s tree I selected Pines using a Colorado Trail setting, had a wonderful reference image to work with from pmp, but used a lot of artistic license in working this piece. The oil pastel (11 x 7, odd size – used left over surface) was painted on Mi-Teintes gray tinted pastel paper. Used my fingers as the primary tool on this piece, all I can say is I think my fingers are permanently stained Sap Green – lol, with a bit of Sepia and Indigo! Thank you for checking in, I enjoyed working the scene – Colorado is a beautiful place. Thank you so much for going back into my paintings and taking time to write such a beautiful comment. Love this Mary. These trees are alive! Thank you so much Nia – so glad you enjoyed this piece! Just beautiful, Mary: I love it! 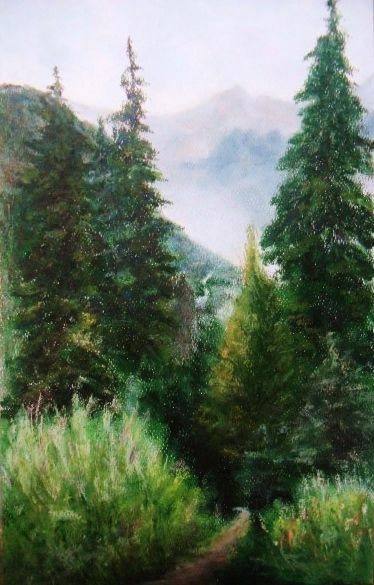 I’ve been to Colorado only a few times, but I can still see that you have captured the essence of it’s natural beauty, with the rich evergreens complimenting the Rocky Mountains backdrop. I can only imagine what you’re hands must look and feel like, Mary!! Thanks so much Elisa for your beautiful feedback. Lol, I thought the green was bad on my hands, you should have seen them yesterday when I got done with all the reds and oranges from a Fall scene painted! Well done on the different shades of green on the trees. Thanks Frank! So much green was getting me a bit nervous, but the deep indigos and magenta, and hints of compliments helped giving some relief. This is lovely, there are so many levels to this painting. From the ground up to the highest elevation of the mountains is a build up and is exciting! Starting from the ground, the trail lined with bushes highlighted from the Sun leads into the darkness and gives great depth because of the sharp contrast of light and shadow. It’s a great way to define space perception! I like the fact that all your pine trees have different heights too, which takes my eyes to the next level! I love how you treated the mountains.The color graduation which is getting lighter and lighter, really reflects the distance. Overall the scene is wonderful and the pine trees a perfectly colored and shaped! Great study and I can definitively say there has been great progress with each challenge! Thank you Eva for your time spent writing your thoughts – I really appreciate your thoughtful feedback. I self-talked a lot while working on this piece and a few coffee breaks which gave me the chance to stand back and assess where the piece was going. So happy that you felt much of what I fretted about came worked, thank you again.